From what I understand (and I encourage my readers to chime in) the English definitely make a distinction between tea the meal and tea the drink. 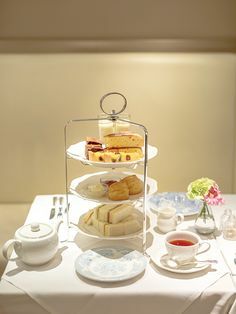 Many people mistakenly ask for “high tea” in England when they mean they want “afternoon tea”, which is closer to Anonymom described above…served with sweets and scones. If you asked for high tea, which is not a fancy tea, but a meal tea (served on a “high” table), it might help explain the concierge’s response. Afternoon tea became the fashion in England, the story goes, through Duchess Anna of Bedford. The English at the time ate at strange hours, with their main meal of the day taking place late in the evening. The Duchess, like many of us, experienced a dip in her blood sugar and asked her butler to bring her a bit of bread and butter with her tea in the late afternoon. Soon she invited her friends to join her and the tradition of afternoon tea began. When one travels through London, many places including the countryside cottage advertise a “cream tea”. The cream tea consists of a pot of tea with scones. The cream, as we learned yesterday, does not reference cream for the tea, but cream for the scones…gloriously rich, clotted cream. Clotted cream is not available commercially in the United States and many tea rooms substitute with a form of whipping cream, sour cream, or cream cheese. Sometimes one can find jarred Devonshire cream (cream from Devon, England) in stores that carry English products, including on-line stores. Devonshire cream is the closest to authentic clotted cream one can find, often. Would anyone like to share their source? Many people also think tea grows in England. In fact, tea needs the sub-tropical climates England (and America, except for one exception) can’t provide. The top five tea-growing countries are India, China, Japan, Sri Lanka, and Taiwan. All tea drunk in England has been imported to England. It is not the English, however, who drink the most tea per capita. That honor belongs to the Irish. I’m almost positive Narnia’s creator and J.R.R. Tolkien’s friend did not need doilies or chintz to enjoy his daily ritual. :-). Like much of the globe, the English tradition of taking an afternoon break struggles not to fade as life “speeds” up. It takes deliberateness to practice tradition, value relationships over productivity, and not throw out “quaint” for the new fads. I hope when I finally have the chance to visit England to find the cream tea in the countryside, not paper Starbucks’ cups in everyone’s racing hands. We’ll see! If you’ve visited England (or live there!) and taken tea, we’d love to hear about your experience. Beat cream cheese well, add sugar and vanilla. Gradually add whippiing cream and beat until stiff. Chill 2-24 hours. You are right, Jenny: in England “afternoon tea” is what we Americans think of when we think of tea. 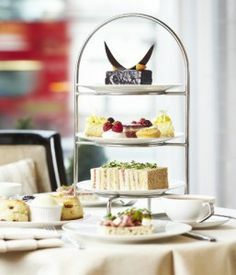 In London, both the Ritz and the Savoy offer gorgeous afternoon teas although be forewarned–they aren’t inexpensive! I was last in London in February and we had a $200 tab for 3 of us at the Savoy. If you are in the English countryside, you will often see a hand-lettered sign near a farmhouse offering a “cream tea.” This is a simple pot of tea with a scone or two (or perhaps a slice of cake) with Devonshire cream. Very different than formal afternoon tea, but equally charming and yummy! Jaime, your recipe sounds great, but no, it isn’t anything like the English version. The cream in England is very different than ours due to pasteurization regulations, so I don’t think you could really make an identical recipe here. Firstly, I wanted to thank you for your writing on this site – I’m a closet reader (as I’m sure you can tell from your audience statistics!) who enjoys reading. I particularly enjoy the humanising aspect of the writing, which places all of this tea drinking within the context of friends and family – great stuff. Truly enjoyable. Remembering that Victorian era evening meals used to take place exceedingly late in the evening (circa 10 p.m. in “society”), there would naturally be room for some extra nourishment between lunch and dinner. As you pointed out, this is usually credited to Duchess Bedford (among others), and rapidly caught on throughout all levels of society. Working class families were, understandably, a bit more utilitarian, being driven by the needs of a heavy work-day, and so taking their evening meal at 10 p.m. became very impractical – especially given the overheads required in actually staying up that late – gas lighting was very expensive, and so late dinners were really the preserve of the more advantaged classes (recalling that we were extremely hierarchical back then, much like modern Japan). So, with “dinner” being inappropriate for many, the role of “tea” (the meal) became more important. Working class fathers and their sons would come home and have their meal immediately, in the late afternoon / early evening. In all classes of folk in England, you still hear children asking, “Mum, what’s for tea?” when they come in hungry after school. That’s “tea”, the meal. It’s really just dinner. In modern England, it’s a prime discriminator between social classes. Those with so-called “upwardly-mobile” aspirations soon learn to stop calling their evening meal “tea”, and start referring to “dinner”. Restaurants only serve “dinner”, of course – which explains why visitors to England might not hear of the meal referred to as “tea”. This is absolutely distinct from any notion of drinking tea and food that goes alongside it. At tea (the meal) you probably wouldn’t drink actual tea itself – we don’t usually drink tea with food, much like the Chinese, oddly enough. Having said that, Samuel Pepys famously wrote that “I dilute my food with cups of tea” – again reflecting the Chinese folk-wisdom that it is bad for digestion to dilute one’s food with liquids. Of course, this doesn’t stop people drinking wine for some reason! 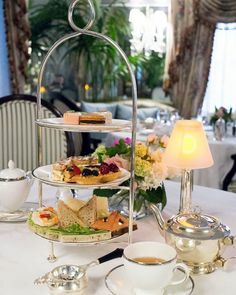 Moving on to the subject of drinking tea (rather than the meal), “afternoon tea” is the (in)famous English speciality, involving the actual drinking of tea, with some light accompaniments. If these accompaniments are scones and cream, you have decided to take “cream tea” for your afternoon tea. So, those little cottages across the countryside that offer “cream tea” are of course offering you “afternoon tea, with scones and cream”. “High tea” is an interesting one. I’ve read many times (usually by overseas writers) that it equates to the meal called tea – but this isn’t quite right. Tea the meal (as above) is just a common name for dinner, these days. 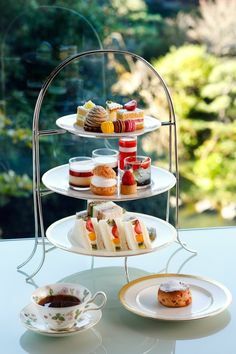 The only time you’ll see “high tea” on offer is in good hotels, restaurants, and colleges and it refers to tea served with something more solid than one would traditionally have with afternoon tea. Typically, it’s a buffet table covered in small bites to eat. So, in a way it’s a meal – but it’s a very light one. 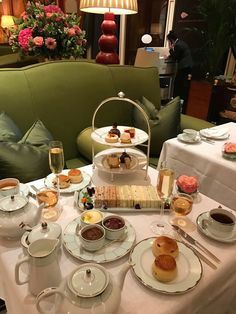 You might well go on to have dinner in a restaurant later in the evening, and so “high tea” fulfils its traditional role in “society” – forming the gap for some nibbles between lunch(eon) and dinner. “High tea” is fairly formal and ceremonial, without being fully formal; for example, my college has one or two during the summer months to celebrate certain occassions, and it’s held outside. It has an old-fashioned feel to it. 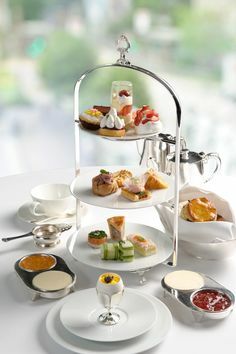 Most visitors to England will enjoy a good afternoon tea, but High Tea is a little more elusive. I suspect that many hotels will put one on in order to satisfy the need, but it is usually reserved (in the hearts of the English) for more formal meetings or minor celebrations. Thank you, Hobbes and Carina, for your great perspectives! I’ve heard the same about the Aussies and want to find out if it’s the case. So, Hobbes, I assume you are from England and are verifying that the English also use “high tea” to describe a formal setting. Is that correct? Thank you for answering my question. Thanks also to the others who commented on the history and tradition of the English tea. I have just read “Clotted cream is not available commercially in the United States” and I feel so sorry for you over there in the United Sates to not be able to enjoy such an delicious cream, I’ve been enjoying it since I was a little girl holidaying in Cornwall near Devon.